In a medium bowl, whisk together flour, almonds, cocoa powder, baking powder, salt, espresso powder and cinnamon. In a large mixing bowl, beat together butter and sugar until smooth and creamy. Beat in eggs and vanilla until thoroughly combined. Toss half of the dry ingredients into the bowl and mix just until combined - add remaining half, mixing just until combined. Evenly divide dough in half, then flatten each into a disc and wrap well in plastic wrap - chill until firm, at least one hour. Unwrap one disc of dough. On lightly floured surface, roll out dough to a scant 1/4" thickness. Using a 2 1/4" to 2 1/2" flower-shaped cookie cutter, cut out as many shapes as you can. Repeat process with remaining disc of dough. Gather together scraps and roll once more, chilling the dough first if necessary. 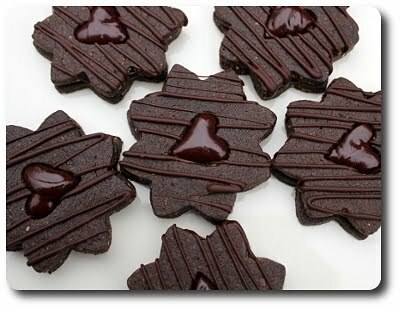 Using a 1/2" round or heart-shaped cookie cutter, stamp out the center of half of the cookies. Place cookie tops and bottoms about 1" apart on parchment–lined baking sheets. Place into the freezer until firm, about 15 minutes. Place cookies into the oven and bake, rotating halfway through, until slightly firm, about 12 minutes. Remove and allow cookies to stand for two minutes on the baking sheets before transferring them to wire rack to cool completely. Drizzle chocolate over the tops of cutout cookies (the cookies with the hole in the center). Set cookies aside and allow chocolate to set, about 30 minutes. Place dark and milk chocolate in a heat-safe bowl. In a small saucepan, bring cream and salt just to a boil - pour over the chocolates, whisking until smooth. Whisk in butter. Spread about 1 teaspoon of the warm filling onto each cookie bottom. Place chocolate-drizzled tops on filling and press gently to adhere. Let cookies sit about 30 minutes to allow filling to set before serving. Makes about 22 sandwich cookies. They look too pretty to eat, but I bet they taste great! I wouldn't say they look too good to eat...I would say they look too good not to eat!!! This cookie is so cute!! such wow factor!! thanks. Luana - Never too pretty to eat! I love how pretty they are and they have way too much chocolate not to be delish! I've been coming by here for a while now, and these cookies inspire me enough to say hello and thank you for sharing. :-) I will be making these soon! Lisa - Thanks for making a comment! I hope you enjoy the cookies!